Stenocarpus sinuatus or Firewheel Tree is an Australian Native tree, a medium to tall tree rainforest tree growing to a height of 30 – 35m, but slow growing. In many areas these trees are lightly pruned to maintain a more compact growing habit. Widely grown in Queensland Stenocarpus sinuatus are related to the Proteas. Also widely used as an ornamental tree in parks and larger gardens through New south Wales. These are a tree that thrive in humid conditions, so some extra water during dry summers will be appreciated. 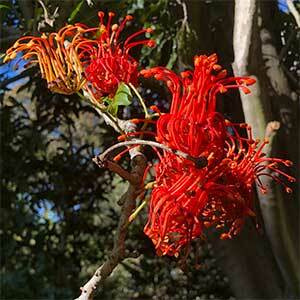 The Firewheel Tree has spectacular, bright red flowers during summer. Originally from the rainforests of Northern NSW to Queensland this wonderful colorful tree will cope with cooler temperatures and grows well in Melbourne. Stenocarpus sinuatus or ‘Firewheel tree’ require a well drained soil and full sun to part shade is best. Great trees for street planting or a large shade or feature tree, as is proven by the fact that they are now grown in the USA especially in California where it is used as a street tree, as well as Europe. Slow growing initially, growth rate will be improved with a humus rich soil and some slow release low phosphate fertiliser applied in the early years of growth. Young plants should be staked to allow for a good upright trunk. Although in tropical and sub tropical climates this is a tall tree to 30 metres, it will grow in cooler climates where height is more like 10 metres. Height – To 30 metres, usually less in cultivation. Spread – Will form a cron to 5 – 10 metres.